Not every case of sinusitis heals quickly and without complications. Chronic forms are a challenge for otolaryngologists. New studies show where things are heading pharmacologically and surgically. An acute infectious rhinitis can quickly develop into acute sinusitis with bacterial or viral involvement. If symptoms persist for more than three months, or if at least four instances per year occur, otolaryngologists consider the case to be chronic. Bony narrow access ways are considered to be risk factors. Sooner or later irritation of the mucosa leads to new tissue growth via inflammatory processes, and ventilation of the sinuses is impaired. More than two million people per year contact their physician because of this. 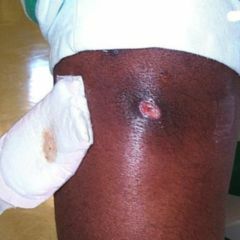 For those affected the bacterial colonisation over the medium term changes in comparison to that in an acute infection. 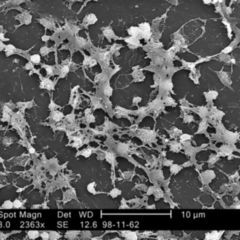 Bacteriologists have mainly found Staphylococcus, Streptococcus, Pseudomonas as well as enterobacteria. Vaccinations have unexpected effects here. Otolaryngologists working under Maria T. Peña, Washington DC, investigated the pathogen spectrum for orbital sinusitis complications. Background information: Since 2000, children and young people in the U.S. have been given a seven-valent pneumococcal vaccine. As part of their study colleagues took samples of 128 children who had gotten sick before 2002, therefore before a nationwide vaccination. A further 145 children suffering from orbital complications of sinusitis from 2003 on were added. 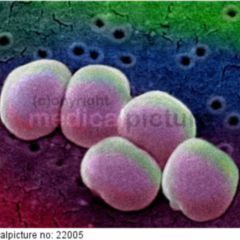 In the blood of the older group from among these young patients doctors found Streptococcus pneumoniae (22 percent) and Streptococcus viridans (12 percent). Both germs disappeared via vaccinations. 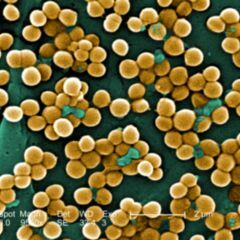 Alongside this Staphylococcus aureus was found more and more frequently – prevalence rose from 20 to 42 percent. Every second sample was methicillin resistant. Similar considerations can of course not be applied to directly describe Germany. Nonetheless pediatricians there have been recommending pneumococcal vaccination since 2006; the pathogen spectrum would however have changed. One piece of advice now given in the instance of serious sinusitis complications is to use antibiotics that work against resistant germs. It’s not always the case that we have to resort to reaching for such preparations. If a chronic sinusitis runs its course without complications, topical applications ranging from sodium chloride to corticoids are recommended. Calvin C. Wei, New York, pursued the question of how effective these therapies truly are. Together with colleagues, he conducted research in Embase, in the Cochrane Library and through PubMed in Medline. With regard to sodium chloride solutions he found 16 studies of high methodological quality which verified a benefit. Saline solution has proven itself both as a standalone treatment option as well as in the relief of postoperative pain. With regard to corticoids in the literature there were as many as 25 randomised, controlled trials. These individual studies verified a benefit when patients had to deal with polyps as a result of their sinusitis. Otherwise, the data is not sufficient for making a recommendation. Sprays with antibiotics or fungicides showed no significant effect – the respective medications did not perform better than saline sprays. If, as a result of chronic inflammation prolonged olfactory disorders occur, new strategies exist: Michael Damm of the University Hospital of Cologne has investigated to what extent targeted training provides a remedial response. For this purpose he enrolled some 170 patients of 24-65 years of age in a multicentre, randomised study. All participants had an infection with olfactory disorders for a minimum of eight weeks, and a maximum of 24 months. They were required to regularly sniff spikes of eugenia oil, eucalyptus, lime and phenyl ethyl alcohol at high concentrations. In the comparison group identical substances were used, but in more strongly diluted form. Doctors tested the olfactory function over extended periods. After four months the olfactory samples between the two groups were exchanged. For assessment the scientists included as criteria the ability to distinguish different odours, threshold values, and general perceptivity. In the first quarter period olfactory performance for the high concentration group improved 26 percent versus 15 percent for the low concentration group. These values rose four months later to 46 versus 31 percent. And among patients who had suffered less than a year from their perception disorder they were even able to record a difference of 63 versus 19 per cent. The molecular mechanisms are still unknown. We can assume that regeneration processes in the olfactory epithelium are accelerated. If pharmacotherapies do not bring the desired result, ENT doctors often advise an OP. Michael J. Sillers and Christopher T. Melroy from the U.S. wanted to know who benefits from a balloon dilation. For patients, the procedure is more comfortable and less painful than endoscopic sinus surgeries, the authors argue. With regard to the approximate 600 dilations that have been described in scientific journals, only five patients gave indications of having a lot of pain, and complications occurred only in individual cases. The method is especially suitable in instances of narrowing of the sinus frontalis, maxillaris and sphenoidalis, they add. When the sinus ethmoidalis is affected the authors consider hybrid interventions involving balloon dilation and “bloody” OP to be plausible. Also, from a cost perspective there is much which speaks in favour of the balloon: American doctors expect savings of 3,000 to 5,000 U.S. dollars per procedure. This individual approach also pays in terms of health economics.